Suspect description: White male, 45 to 50 years old, 5’5 to 5’7, dark coat, black hoodie and black pants. 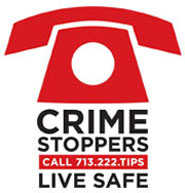 On Saturday, January 5, 2019 at 8:50 pm, the complainant was sitting inside his vehicle about to head home from work at 3201 Graustark, in Houston, Texas. Two days later, officers located the victim’s vehicle at 2300 Francis Street. A witness approached officers and informed them that on they had seen a male attempting to put air in the tire at the Gulf gas station at 3305 Emancipation Street. Video surveillance captured the suspect from the gas station. Suspect description: Suspect #1: Black male, late teens, 5’7 to 5’8, 140 pounds, small build, black hair, medium complexion, white tank top and black pants. Suspect #2: Black male, late teens, 5’6, 140 pounds, black hair, medium complexion, red shirt and black pants. Note: The Houston Astros employee off-duty police officers at and around the park during games, resulting in the arrival of several officers within minutes of the robbery, but the suspects were able to avoid capture. It is believed that the suspects may be homeless and familiar with the area from where the robbery occurred. Suspect description: Black male, 30 to 35 years old, 6’00 to 6’02, 150 to 160 pounds, black hair, brown eyes, gold grill on bottom teeth, wore a red burgundy shirt, but removed it and had a black shirt on after the incident.